The Series STD2000, which accepts a majority of European currencies, was designed to offer high capacity storage, a very strong platform and flexible insert designs, providing versatility suitable for a range of store formats. The removable insert can accommodate 8 coins and 4 notes. 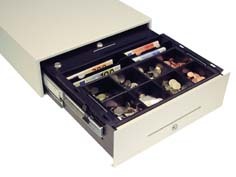 Extra deep coin cups and note compartments allow for a substantial quantity of cash to be stored within the drawer with additional storage underneath the coin compartments to hold different POS accessories. The area can be adapted to feature a lockable box, which can hold bagged coins, stamps, vouchers and any high-value items that need extra security. When configured with push to open push to close lock, this manual drawer is the favorite choice of drawer by lottery and similar applications in the United Kingdom.